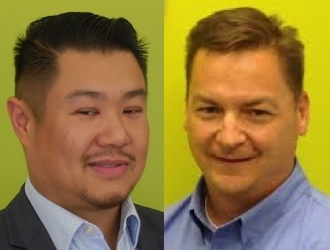 City Point Partners is pleased to announce that Matt Bessette, On-Site Project Manager and Geoff Wong, Document Control Manager, have been promoted to Project Manager and Project Controls Specialist, respectively. Matt, a 25-year veteran of the Architecture/Engineering/Construction industry, has worked for City Point Partners for over 5 years. A valuable on-site presence, Matt has served such clients as MassDOT helping them to recently complete their $29.1M Central Research and Materials Laboratory in Hopkinton as well as the Rising Tide Charter Public School and their 98,000 sf renovation project in Plymouth, MA. Geoff started out as a member of the firm’s document control team serving our clients on the MBTA’s Fitchburg Commuter Rail Improvement project and the Knowledge Corridor Upgrade project, and he has since broadened his skills to include multiple supporting roles within the project controls group. Both Matt and Geoff serve some of our most valuable clients in both vertical as well as horizontal construction. Congratulations to both!